In a strange way, it’s been nice to see a flurry of activity from the Bulls front office in the point guard market. I was not alone in my frustration a season ago when the Bulls trotted out the oft injured Derrick Rose, diminutive Aaron Brooks, and local real estate owner Kirk Hinrich to hold down the fort for a second consecutive season. The swap of Cameron Bairstow for Spencer Dinwiddie was a low-risk move with the tiny potential for a nice payout. The big trade that sent Rose to the Knicks was judged to be a positive one by this writer, mostly because of the addition of the (suddenly) cheap Robin Lopez, but also because of the potential upside Jerian Grant brings to the table. And while Jose Calderon is nothing more than a shooter at this point in his career, I could envision him carving out a successful role next to Butler as a floor spacer. All of these small moves were nice, but the Bulls were still clearly lacking someone they felt confident could soak up the majority of minutes at the one, a feeling that motivated the team to award Rajon Rando a two year, $28 million contract that reportedly has a partially guaranteed second year. The Rondo signing appears to make sense on the surface. With a roster lacking any proven point guard talent, why not take a one year flier on the guy who lead the league in assists a season ago, averaged two steals a game and hit a career best 36% of his threes? As anyone who watched Pau Gasol loaf through the past two seasons in Chicago knows, the box score does not tell the whole story. A closer examination combined with a careful eye can sometimes paint a different picture than some counting stats in the newspaper. Rondo spent the past season on a typically dysfunctional Kings team that failed to crack .500 for the 37th consecutive season. The Kings scored a lot of points in George Karl‘s high paced system but surrendered even more on defense, posting a net -3 for the season. Rondo’s presence on the floor did nothing to help matters, as the team was more than a point better per 100 possessions when Rondo was on the bench. Plus/minus can be a misleading stat at times. Starting players on talent-deficient teams can have artificially low net ratings compared to their teammates who are able to feast on opposing bench units. But when you consider that Rondo played 70% of his minutes alongside DeMarcus Cousins, who was exactly even in net rating, Rondo’s statistics begin to look more damning. As DeMarcus Cousins runs to set a pick for Rudy Gay, Kemba Walker, Rondo’s defender, turns his head completely away from Rondo and begins to focus his attention on stopping the pick and roll. As soon as Cousins receives the pass from Gay, Walker has completely committed to clogging the lane for any potential drive from the big man. 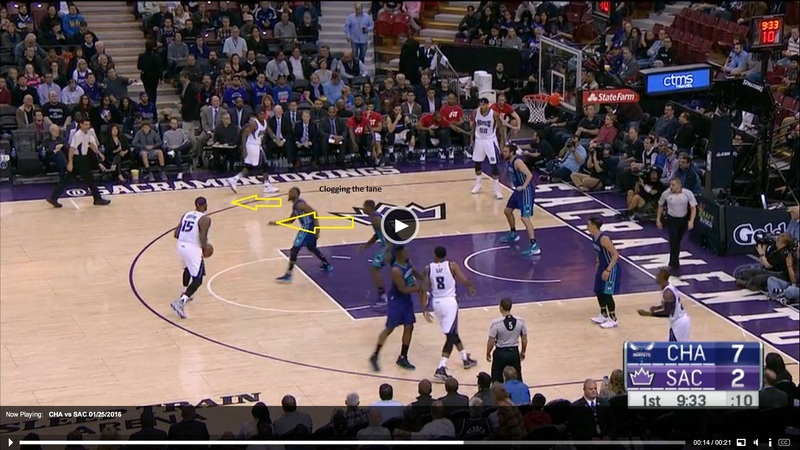 Rondo is left totally alone, a complete afterthought for the defense. Rondo ended up making the wide open three after the ensuing pass from Cousins, but he has been unable to connect on those shots at a high enough rate to force defenses to re-calibrate their strategy. This is the biggest reason I hate the Rondo signing. After struggling through last season with a starting back court that couldn’t make a three, the Bulls are doubling down by signing the worst shooting point guard in basketball. For all of the dynamic things Butler can do on a court, attracting attention off the ball is not something he does. As we saw quite a bit last season, Butler felt most comfortable with the ball in his hands running the offense. To compliment that, the Bulls need to pair him with a point guard who is going to keep help defenders occupied far away from the paint. Rajon Rondo could not be further from fitting that description. I just cannot comprehend what Gar Forman and John Paxson were thinking when they signed Rondo. Do they expect him and Butler to play well off each other? Unless Butler is spending his summer turning himself into a 40% three point shooter, I struggle to imagine a scenario where these two are able to power the Bulls to a half decent offense. If Rondo’s outside shooting was his only issue, it would be bad enough. But there are several other aspects of offense the newest Bull struggles at. Rondo was arguably the single worst transition player in the NBA last season. According to NBA.com, of players to handle the ball on at least 200 transition possessions, nobody scored less frequently, and turned the ball over more frequently than Rajon Rondo. Only Jordan Clarkson and Klay Thompson (who took a lot of transition threes) shot free throws less often in transition than Rondo. All of which brings me to my final complaint about Rondo’s offensive game: his utter fear of the charity stripe. Rondo has failed to crack 60% from the line in four of the last six seasons. And as his percentages have dropped, so have the attempts. Rondo got to the line just twice a game last season, a shockingly low number for the player who finished tenth in the league in drives to the basket. People complain about Rondo hunting for assists to boost his stats, but I think a lot of his hunted dimes are the result of his unwillingness to draw contact in the paint for fear of embarrassing himself shooting free throws. This was a particularly poor market for free agent point guards, but the Bulls somehow managed to overpay for a low upside rental who makes no sense from a roster construction standpoint. Michael Wonsover looked at some of the other point guards the Bulls could have potentially signed for less money who may have also fit better alongside Butler. Allow me to add rookie Wade Baldwin to the list. The Bulls passed on Baldwin to take Denzel Valentine, another old college player with legitimate red flags. Baldwin projects to be a capable defender and a good shooter who does not need the ball in his hands to make an impact. Sort of like an ideal partner for Jimmy. Sort of like the opposite of Rondo. The frustrating thing about the GarPax regime is they have the ability to make smart moves along the margins, but completely botch their bigger decisions. Grabbing Dinwiddie for free? Smart. Getting Justin Holiday back for washed up Hinrich? Savvy! Signing Felicio out of training camp for less than $1 million? Potentially franchise-altering! But between the Gasol signing, the all-in Doug McDermott trade, the Thibs firing/Hoiberg hiring, and now the signing of Rajon Rondo, this front office has proven that they are incapable of making the decisions that count. With training camp just around the corner, the Chicago Bulls are still a man short of the minimum 13 players that NBA teams must have under contract. There has been great speculation as to just who the Bulls might bring in to fill that final roster spot. With depth in the front court looking to be an issue, I believed the Bulls would look to add another big man to the roster, believing all along that Malcolm Thomas, who had a strong showing at Summer League, would get the nod as he has spent time in the Bulls organization and seems like he could provide some decent production given an emergency situation. While my belief that the Bulls would turn to a familiar face holds true, the face that they have turned to was unexpected. 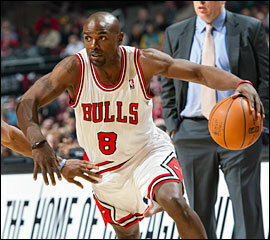 On Tuesday, the Bulls extended a training camp invitation to well seasoned veteran Mike James. James, who is 38, has had one of the more unique basketball careers. After going undrafted out of Duquesne University, James bounced around Europe and semi-pro leagues in the US. In 2001 at the age of 26, James secured his first NBA contract. In his inaugural NBA season, James played in just 15 games for the Miami Heat. But James has proved himself a basketball surivor. While some of the greatest talents in the world fizzle out around 30, James has hung around the league in varying capacities over the last 11 years. After spending the 2010-11 season playing in Turkey, James made his way back to the NBA with Chicago on a pair of ten day contracts. James, who did not put up any eye-popping numbers in his 11 games with the Bulls, showed that he still had the ability to run the point effectively and intelligently at an incredibly cheap price. Last year, the Dallas Mavericks had point guard issues of their own and awarded James a contract. In 45 games with Dallas, 23 of which he started, James averaged respectable numbers, putting up 11.4 points and 5.8 assits per 36 minutes (per basketballreference.com). While James has not yet been offered a contract, this invitation to training camp seems to put him in the lead to lock down that final roster spot. As a Bulls fan, the logic for bringing in the veteran is interesting. With Derrick Rose, Kirk Hinrich and Marquis Teague under contract, there doesn’t seem to be room for much room on the roster for another point guard. While Hinrich is an injury risk and Rose figures to be on somewhat of a minutes leash as he returns from ACL surgery, the case could be made that the Bulls do need another capable ball handler. Perhaps the Bulls see James as a potential mentor figure to both Rose and the talented but still developing Teague. While I have no knowledge of how James conducts himself with his teammates in the locker room, I can only assume he is a man of high character who possesses an incredibly strong work ethic, based simply on the fact that not many teams are taking a shot on point guards in their late thirties. While making a big deal out of who the Bulls will feature at Head Towel Waiver seems trivial and silly, over the course of an 82 game season a team will eventually require contributions from everyone wearing a jersey. Whether or not Mike James makes it through camp, or if the Bulls decide to find a fifth big man, the race for the final roster spot remains an interesting story as the Bulls get ready to reclaim the throne in the East.